A prophecy of a righteous judge to come; a shoot of Jesse with the spirit of God. *G(II)249 / GC319 / GC(II)325 Close as tomorrow the sun shall appear / Walk in the Reign (Cooney). I really like this one. “Close as tomorrow the sun shall appear. Freedom is coming and healing is near. And I shall be with you in laughter and pain to stand in the wind and walk in the reign”. Nice little lyrics twist there! The 4th verse mentions specific locations (Soweto, Gdansk, Tiannemen Square, The Bronx), which you could retain or change, as you feel appropriate. This sound sample gives it a bit of a gospel feel. Sheet music and lyrics. 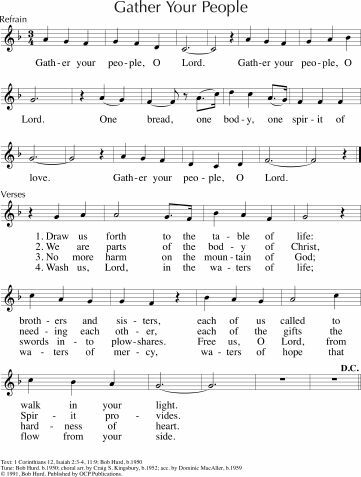 GA281 Gather in hope people of God / Advent Song (Browne / Wood) Joyful refrain, and cantor response verses. "Gather in hope, people of God, sing the Advent song! Song of faith, song of trust, a song to welcome the Christ". The verses seem a bit tricky. TiS 294 / NCH127 / UMH216 / VU008 / LBW058 / ELW272 / HPP133 / GtG129 / PH048 / GC368 / GC(II)373 / CP117 / W&R190 / Cha160 / 82Hml-081 Lo how a Rose e'er blooming / Behold a rose is growing (German 15h Century) I love this traditional Advent song; it's not so well-known in Australia. 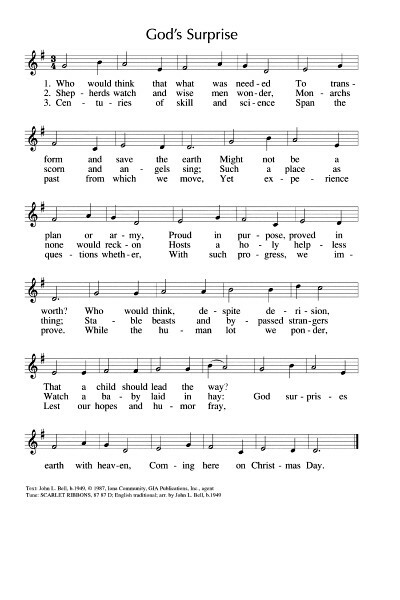 *Cha126 is a responsive reading and sung response based on the same Advent hymn. Lyrics and sound sample. Here's Sufjan Stevens singing it. And Feist. TiS 265 / AHB 193 / AoV1-174 / NCH116 / CH273 / UMH211 / VU001 / LBW034 / ELW283 / GA285 / HPP92 / PH009 / GC317 / GC(II)323 / G(3)395 / CP089 / CP(E) 32 / W&R154 / Cha119 / 82Hml-056 / Lau112 / StF180 / MP493 O come O come Emmanuel (Psaleroilum Cantionum Catholicarum) A very well known ancient Advent carol - so you may want to wait another week before singing it, depending on the traditions of your congregation. Most versions are pretty inclusive. Lyrics and sound sample. There are also two alternate versions (one by Sue Wickham and one by John Henson), set to the same tune, but with more modern lyrics and ideas. See the Facebook Group for lyrics. Here's Sufjan again. And Sam Billen. Those last two recordings are maybe a bit too laid back, really... Here's a beautiful arrangement for choir by Kodaly. Oldy-but-a-goody. *Unknown source Alleluia, the great storm is over (Franke) lift up your wings and fly! I especially love the image of the infant sleeping while the mother sang until the bridegroom returned. The chorus is really catchy and very easy to sing. 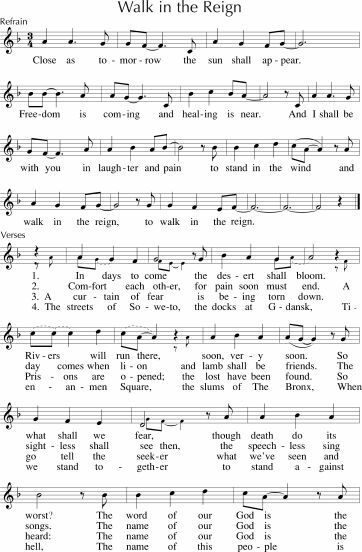 If not familiar, you can use a cantor or soloist for the verses and invite the congregation to join in the chorus. We tend to sing this more like a gospel anthem. Lyrics. Video with poor image but good sound. 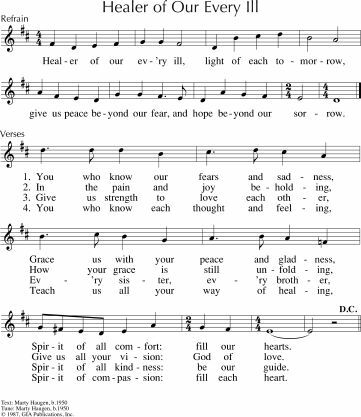 Online resource A child will lead the dawn of grace (Garland) Sung to a standard hymn tune (MARYTON), lovely new words that speak of justice through this child that is coming. Free sheet music. *Iona / NCH153 / GtG138 / CH295 / G(II)267 / GC350 / SP22 / StF222 Who would think that what was needed (God's surprise) (Iona community) I love the challenge to our priorities in this song. The lyrics are to the traditional tune SCARLET RIBBONS. Lyrics and sample sheet music. Keyboard sound sample. New words to old tunes. Emergent Psalter For he shall deliver the poor (Everett) A Psalm refrain. It's not amazing, but I'm having trouble finding good Psalm refrains for this particular Psalm. WCC website: Hear the message we now are proclaiming / El mensaje que hoy proclamamos. This jubilant Colombian song of liberty and new life for the poor and suffering would fit well with this reading. Free sheet music! SP&P137 The world is hungry for justice / Sweet Justice (Gilio / Ressman) This song is new to me, and the words are very suitable for this reading. It's a ballad and the verses would be best sung by the musicians at first, with the congregation joining in on the chorus until they get to know it. *NCH36 / PH219 To God compose a song of joy (Duck) “The God of Justice comes to save; let earth make melody; For God will judge with righteousness and rule with equity” Beautiful words. 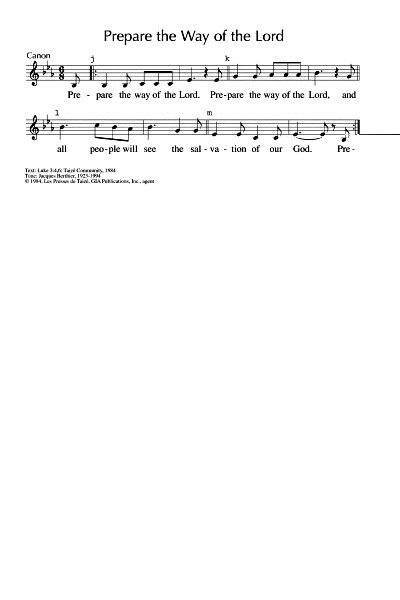 I prefer this sung to the tune in NCH – the standard hymn tune RICHMOND (TiS 425). New words to old tunes. *NCH588 / StJ / WoV763 / ELW717 Let justice flow like streams (Parker Huber) Excellent words to the very familiar tune ST THOMAS. New words to old tunes. Living in harmony; root of Jesse. See also the suggestions for the Isaiah reading above. AoVK-99 May the hope of God surround us (Schmidt) A simple blessing. URW299 O many people of all lands (Barranda) A good song supporting multicultural harmony at home, at work, and in church. John the Baptist; Prepare a way; the brood of vipers bit. TiS 688 Come to be our hope O Jesus (Marachin) This is a really fun Latin American song from the World Council of Churches Assembly in Canberra. It's not easy the first time, but once you've heard it, it's very catchy. The words are really excellent, despite a slightly clunky translation. It would be worth teaching to your congregation! *TiS 263 / CH607 The bright wind is blowing the bright wind of heaven (Taylor) Excellent words of the changes brought about by a "bright wind" that blows away the chaff of our hating, and fans the flames of love. Joyful tune. Online resource: Prepare, prepare the way of the Lord (Kleinheksel). A simple round, particularly appropriate for kids. Adults mind find it a bit simple, but it’s quite effective. Worth a look. Available here. Online Resource Prepare the way of the Lord (Council) A nice setting for a choir. Free sheet music. *Recorded Music: Prepare ye the way of the Lord - Godspell (Schwarz / Tebelak) This is still a great call to worship for this Sunday. You know, the movie is really dated, but the scenes seem kind of fresh again, at least, for this song, except maybe for that nurse's uniform. Get that gospel choir going if you have the sheet music. Track it down! Youtube. *?Recorded Music: Prepare ye the way of the Lord (Smith) Love the Aussie accent in the readings for the Intro to this. I wish they had used TaikOz for the drumming.... ah that would have been something amazing.... I really like the excitement of the intro, and the song is just a chorus really. Maybe I just like those jangly U2-esque guitars. "Come on, church". Cracks me up. But it's very inspiring. Youtube. Online resource: Down by the Jordan (Winfrey-Gillette). Good inclusive words to the familiar tune LOBE DEN HERREN. Lyrics. CH281 / UMH202 / VU9 / WoV626 / LBW626 / ELW248 / HPP83 / GtG105 / PH012 / G(II)337 / GC318 / GC(II)337 / CP091 / CP(E) 35 / W&R161 / Cha142 / SP15 People look East. The time is near (Farjeon) Quite nice and joyful Advent song. Note that it is cold-climate Northern Hemisphere specific. Lyrics.